The search king is hardly alone in hoarding cash, but could its increasingly bulging balance sheet could be used in more productive ways? With $65.4 billion in cash and equivalents sitting on Google's (NASDAQ:GOOG) (NASDAQ:GOOGL) balance sheet, it raises the question of how best to utilize all of that ready money. Some of Google's biggest rivals, including Apple (NASDAQ:AAPL), have used their sizable cash positions to reinstitute dividends. Others have used cash to reinvest in their business by spending it on research and development or paying down debt, for example. Brian Stoffel (Buy Twitter): As it sits right now, Google is the king of search and -- along with Facebook (NASDAQ:FB) -- has the type of data on user behavior advertisers salivate over. The Big G, however, hasn't had nearly as much luck when it comes to social media. Google+ has been a lukewarm experiment at best. Google is well aware of the fact that a transition to mobile advertising could mean big bucks for the biggest winners. While the company's core search business will no doubt benefit, mobile search is being encroached upon by individual apps that get the same job done. Google and Twitter (NYSE:TWTR) have announced a number of collaborations over the past year, and with Twitter stumbling lately -- its stock is down 45% from 2014 highs -- Google has the familiarity and incentive to pull the deal off. No one knows how to monetize big data better than Google, and Twitter is not shy about amassing as much user information as it can. Tim Brugger (Dividends): Google's bulging balance sheet is not the most compelling reason it should (finally) succumb to paying a dividend to its shareholders. Yes, Google management makes it abundantly clear most every quarterly conference call that it isn't interested in paying a dividend now or in the near future. But that doesn't mean it shouldn't. In addition to padding its balance sheet by over $6 billion in Q1 of this year, another key factor in determining an "appropriate" time to give back to shareholders is free cash flow (FCF) -- and Google is swimming in it. Last quarter, Google increased FCF year over year by 80% to a whopping $3.69 billion, and net cash from operating activities also jumped by 50% to $6.62 billion. Not only does Google's balance sheet support a payout today, but its operations virtually ensure it would continue to grow its cash position -- dividend or no dividend. Why a dividend? It would have an immediate, positive impact for shareholders in two ways. The most obvious is the immediate income stream for shareholders. Also, instituting a dividend would almost certainly boost Google's share price, just like what happened to Apple when it last took the lid off of its cash barrel. Anders Bylund (Stay the course): I know, I know. I'm supposed to come up with some dramatic change in Google's cash management processes, turning the company upside down in search of a better strategy. As a longtime Google shareholder, I'm actually very happy with how the company manages its cash budgets. 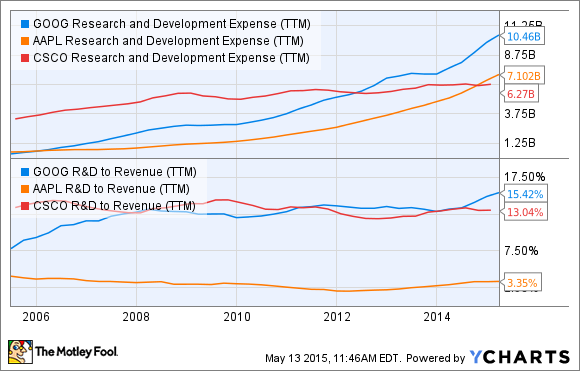 Google's R&D budgets are rising fast, both in absolute and relative terms. Meanwhile, Apple and Cisco only keep their research efforts fairly steady, compared to their incoming sales. I know which tech horse I'm betting on for the long term. For a company always on the bleeding edge of high technology, that's the only reasonable way to stay relevant for decades to come. I love Google's approach and can't really ask for anything more. The minute Google takes its foot off the innovation pedal, I'm rethinking my investment in the company. I don't want a dividend, no buybacks (beyond reducing the dilutive effects of stock-based compensation policies), and am not holding my breath for the next game-changing buyout. Google's own research labs provide plenty of value already, and I only want more of that. The best I can offer is one little tweak. If that spare cash is starting to itch in Google's pockets, the company would be welcome to step up its R&D budgets even further. If the cash is locked up abroad, start another development center somewhere like Hong Kong, Montevideo, or Stockholm. That'd be one good way to eat into excess cash reserves -- and accelerate an already very dynamic race toward the distant horizon. Bob Ciura (Share buybacks): A smart way for Google to utilize its cash hoard for the benefit of its shareholders would be to buy back stock. Normally, my first response to this question would be to suggest a dividend. But Google management has signaled little to no intent of paying a dividend any time soon. As a result, I'd say share buybacks are the next best way to return cash to shareholders. Google's $65 billion cash pile -- up from $59 billion -- equals approximately 18% of its market capitalization. That equates to about $94 per share. Google could easily utilize half of its cash to buy back as many as 61 million shares. That would reduce Google's diluted share count by about 8% and significantly boost Google's per-share earnings. Some might balk at this idea, because Google, like other technology giants, holds a lot of its cash overseas. Google would have to pay a hefty repatriation tax in order to bring this cash home. But it could easily leverage its fantastic balance sheet to raise debt in order to finance its buyback. This is a common strategy that other tech companies -- including Microsoft -- have recently implemented, because interest rates are so low that raising debt is not very costly. Google's track record creating value through mergers and acquisitions is spotty at best. Google's acquisition of Motorola Mobility in 2011 for $12.5 billion and subsequent sale this year to Lenovo Group for $2.9 billion is one example. Poor decisions like these destroy shareholder value. With a dividend payout effectively off the table and a less-than-stellar M&A history, the next best (and most realistic) option for Google is to buy back stock.